After a distinguished business career of 33 years, followed by 14 years as Executive Vice Chancellor for Business Affairs, and, ultimately Chancellor of the University of Texas System, Dan Burck continues to serve higher education, his state, and community through active leadership in a wide variety of charitable, educational, fraternal, and business organizations. In the private sector, he currently serves as Independent Chairman of the Board for American Campus Communities (ACC-NYSE), the largest provider of student housing in the U.S. He currently serves on the Executive Committee of the University of Texas System Chancellor's Council, on numerous other advisory boards serving UT Austin and The UT System, and is a Life Member of the UT Ex-Students' Association. In November 2014, he was inducted into the McCombs School of Business Hall of Fame at UT Austin. 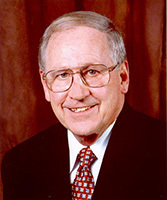 Burck is a 1956 graduate of the University of Texas at Austin. He was awarded Kappa Sigma's Tau Man of the Year in 2001 and is the sixth initiate of the Tau Chapter to be awarded International Kappa Sigma Man of the Year.